A dog’s hair and your carpet can be akin to Superman and Lex Luthor: mortal enemies to the bitter end. The hair gets entwined with the carpet fibers and before long, you find yourself thinking maybe it would be easier if you could just start a new design trend involving dog-hair rugs. Though it can be a long and arduous war, this cleaning war is one that you really can win. Take a few tips from us, and you may soon find your struggle with dog hair won’t always be uphill! 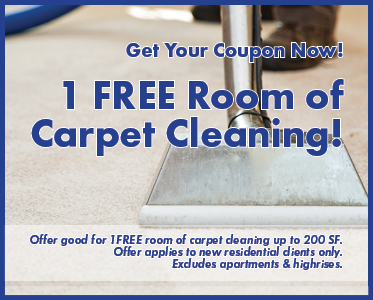 Let us discuss a multi-pronged approach to help you get your carpets fresh and clean. For starters, let’s go to the source of the problem — your dog. This, of course, is where the hair-rug gets its hair. One thing that can make your dog shed more than normal is their diet. Make sure their kibble is giving them the majority of their protein from a meat source instead of a vegetable. To do this, check out the list of ingredients on the kibble bag and see what is listed as the first five items. You want to see meat and/or meat products listed in the top five ingredients. Now, we’ll discuss two weapons of choice for your hair battle: the shedding blade and the slicker brush. For longer and medium coated dogs, the shedding blade can quickly become your best friend. This tool is one you will want to step outside to use, or use in a bathroom where you can shut the door and contain the hair. There will be more loose hair removed than you would’ve thought possible. Soon, you’ll find yourself surrounded by fluffy tumbleweeds of fur. When used in conjunction with the slicker brush, you can greatly reduce the amount of hair you see around your house or apartment. The slicker brush is best used after the shedding blade (or by itself on short-haired breeds). This brush will finish removing any loose hair the dog still has, and it will leave the coat looking shiny and smooth. The slicker will not throw hair around like the shedding blade, so it’s good to use wherever is most convenient for you. Another item you can use for short-haired dogs is a glove, or brush, with rubber nubs. The rubber helps remove any loose hair and it is easy on the dog’s skin. 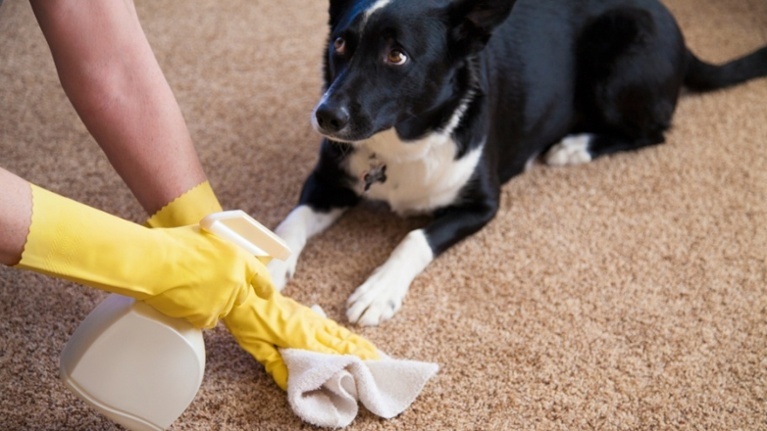 Now that we have talked about some of the strategies you can use on the source of your problem, let’s talk about cleaning up what is already on your floor. A rubber-bristle broom is a miracle worker when it comes to pulling up hair from carpet. Going over your rug with this kind of broom before you vacuum is highly recommended. It can help ease the wear and tear of your vacuum, and will help untangle stubborn hairs from carpet fibers. You will also find that you can remove twice as much hair by using this broom first, versus using a vacuum alone. Once you have an initial once-over done with the rubber-bristle broom and vacuum, the final step to achieving the fresh carpet you desire is to schedule a professional cleaning. The deep dirt-removal that a professional cleaner can offer is like no other. When the carpets are clean, the entire place feels clean; when the entire place feels clean, you feel happy. And after all, isn’t feeling happy part of what pet ownership is all about? If you have any questions, comments, or concerns, please doesn’t hesitate to contact us. We would love to talk with you about how we can help make your carpets like new again.